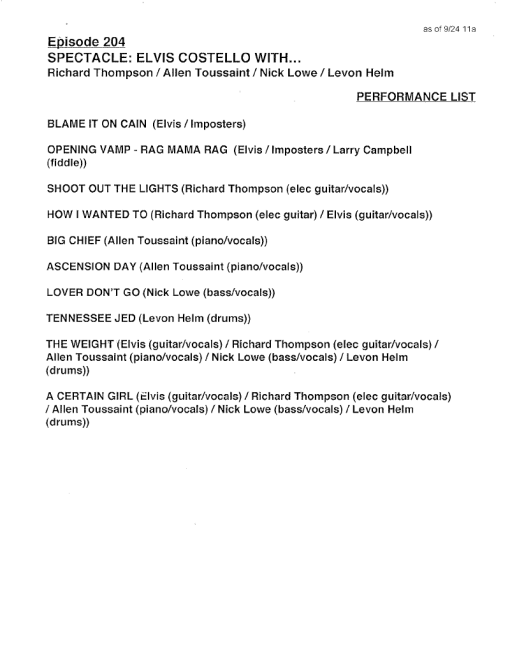 View the full set list from each Spectacle: Elvis Costello With… taping after the jump. 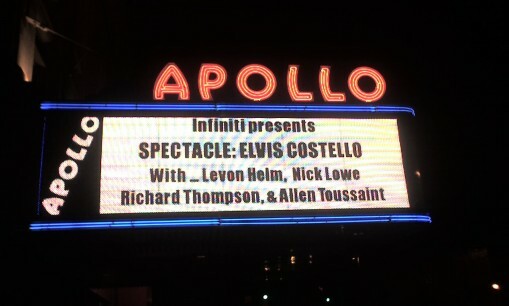 I was fortunate enough to attend Thursday night’s taping of Spectacle: Elvis Costello With… and after seeing the entire thing, I really wonder how they are going to distill this jam packed show down to a brief 45 minute television epsiode (thankfully, I’m not the producer). As for the performances within the show, the full band rendition of “The Weight” (complete with 3 guitarists, 2 drummers, 2 bass players, 1 piano player, 1 keyboard player and Ray LaMontagne) was the highlight of the night for me, followed closely by Richard Thompson‘s “Shoot Out The Lights” and Nick Lowe‘s “The Beast In Me”. While the musical numbers were strong, unfortunately the interview portion of the suffered from an excess of Elvis talking (who seemed to be suffering from a cold) and a shortage of guests answering questions. The quick witted Thompson was the first victim of Costello’s long-winded interview style and I really can’t think of one interesting anecdote he told during his segment. The very funny Nick Lowe, who has a deep history with Elvis, was also reduced to 2 and 3 word answers for most of his allotted time and only told one significant story about how he came to write the song “The Beast In Me” for his former father-in-law Johnny Cash. Levon Helm, who was actually defying doctor’s orders to be at the show, literally didn’t talk at all (because of a severe vocal strain), so he and Elvis did a ridiculous routine where Helm answered questions via drum rolls (if there is any justice in this world, that portion of the show will be cut). Having said all of that, what I saw on Thursday night will be very different from what will actually air on the Sundance Channel, and with the magic of modern editing, surely anything is possible. This is a scan of the set list from the September 24 taping, but it’s not accurate. I recently saw this episode. Had never heard of Levon Helm and I thought the exchange between him and Elvis was extraordinary, and excellent. I am glad they didn’t cut it! In light of his recent death, it is even more excellent and extraordinary. Just goes to show you, everyone has a different view.